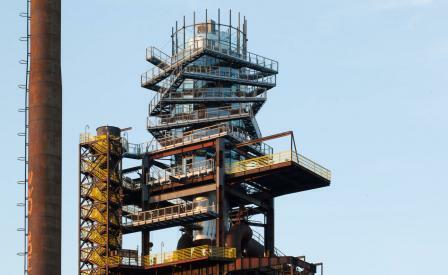 Located on the top of a 60-metre high blast furnace, Bolt Watch Tower and Café is the latest addition to the ongoing revitalisation of Ostrava Vítkovice, a former industrial district in Prague, now listed as a National Cultural Monument. Vítkovice Holding - the owners of the area - tasked Czech architect Josef Pleskot to reimagine the industrial structures into cultural, leisure and educational facilities. Bolt Watch Tower is a dynamic steel and glass arrangement which is made up of a 250-metre long spiral that twists around a central cylindrical volume. Three floors of the tower accommodate a café and club, furnished with Eames plywood chairs. The circular layout of the café - which serves coffee, drinks and a selection of simple snacks - offers an unexpected experience of the machinist architecture and impressive views of the industrial heritage below.